As of this writing, the death toll of Wednesday's earthquake in Central Italy has risen to 280. 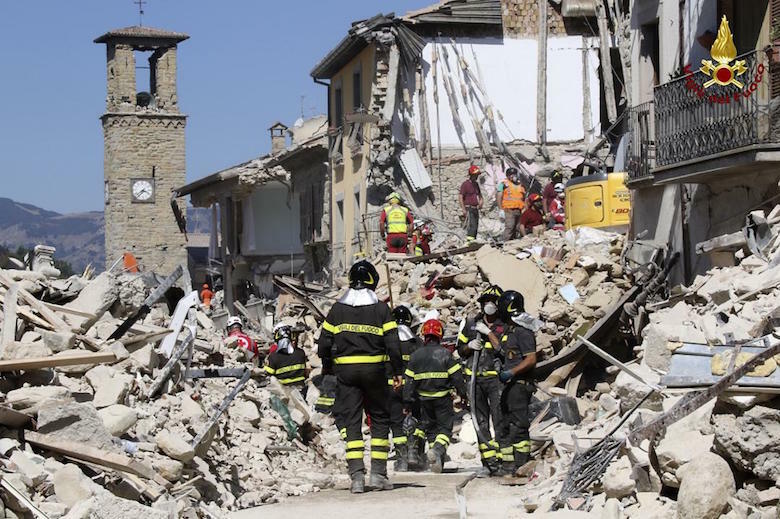 However, rescue workers expect to find more bodies in the rubble in the three mountain communities most affected by the shaking of the magnitude 6.2 quake: Amatrice, Accumoli and Arquata del Tronto. Of particular worry is the situation in Amatrice, where a hotel has completely collapsed. Many tourists had spent the week there to attend the town's annual Pasta Festival. The celebrated specialty dish „Spaghetti all’amatriciana“ is well known all over Italy. While rescue and recovery work is still continuing in the epicentral region, experts have begun to ask why relatively weak earthquakes always seem to generate enormous amounts of death and destruction in Italy. Compare, for instance, the Napa earthquake that occurred in Northern California almost exactly two years ago with Wednesday's temblor in the Italian Appenine mountains. With a magnitude of 6.0 the Napa quake was just a tad smaller than the magnitude 6.2 quake in Italy. But only one person was killed in California's wine country and the damage to buildings and structures was far less than the severe destruction in Italy. Elsewhere in the industrialized world even much stronger earthquakes with magnitudes of 7.5 or more do not generate as much damage as it seems to be the norm for smaller quakes in Italy. 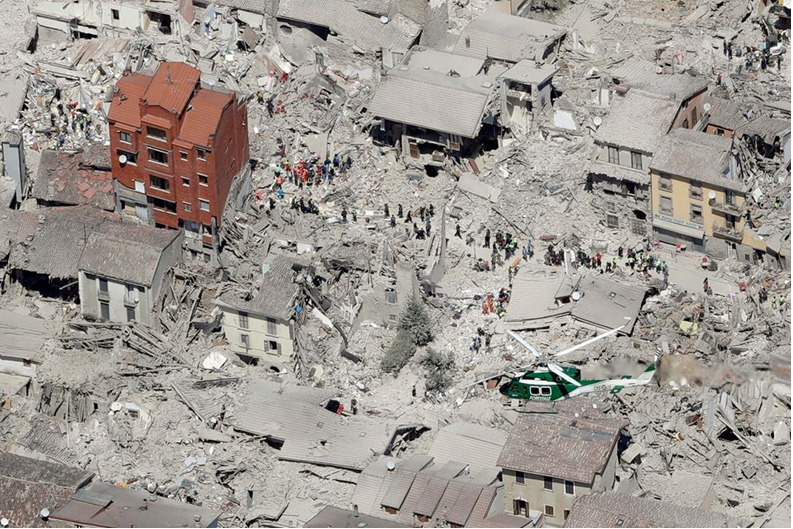 Rescue and recovery teams are still working in the town of Amatrice. Take the L'Aquilla event from 2009 with a magnitude of 6.3, only 25 miles from Wednesday's temblor: 300 people died and more than 10,000 buildings were destoyed. In 2002 more than 30 people, among them 27 pupils, died in a magnitude 5.9 quake south of the current epicenter. Other devastating Italian quakes also do not belong into the class of strong or severe earthquakes: One near Assisi in 1997 with a magnitude of 6.4 caused 11 fatalities, in a magnitude 6.4 quake south of Naples in 1997 more than 2700 people died and one thousand were killed in the Friuli quake of 1976 (M=6.5). One reason for the enormous destruction caused by relatively small quakes in Italy can be traced to the age of many buildings, particularly in small, rural towns and villages. Many structures there date back centuries or even to the Middle Ages. When they were built, nobody cared or had a clue about earthquake resistant construction methods. However, earthquake engineers have also encountered modern buildings which did not comply with those aspects in the Italian building code, which relate to earthquake safety and resiliance. The 27 pupils mentioned earlier died in a modern school building in the town of San Giuliano di Puglia. It turned out that during its construction the earthquake safety measures required by law were bypassed or ignored. Another reason is that - in contrast to other industrialized countries located in seismic zones - Italy does not seem to have a culture of preparing for natural disasters. This sentiment was echoed after Wednesday's quake by Francesco Peduto, the president of Italy's National Council of Geologists. He said in a newspaper interview, that Italy was "lacking a culture of disaster prevention". He added that 40 percent of the 60 million Italians live in zones with a high natural hazard, mostly due to seismic activity but also in volcanic zones, like those around Vesuvius near Naples and Etna in Sicily. Even in areas with high seismic risk, there is little education of the general public on how to behave during earthquakes. While in Japanese and California schools kids are regularly taught to "Drop, Cover and Hold on" when they feel seismic shaking, very few Italian schools have any disaster drills. Peduto estimated that between 20 and 50 percent of all deaths in earthquakes could be avoided, if people knew how to react properly when shaking starts.